Incredible view of Mount Kailash. 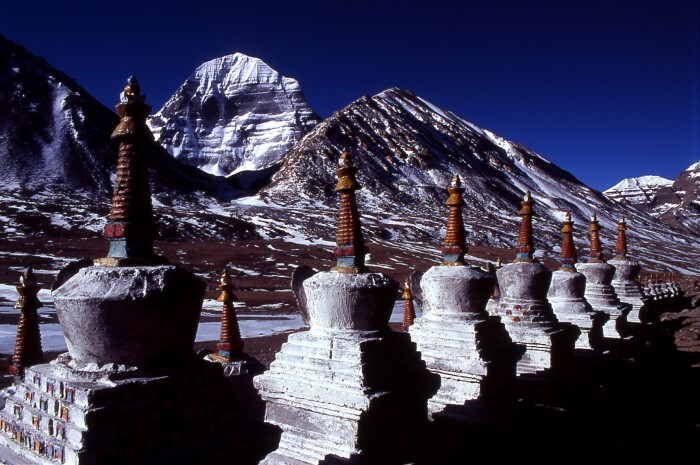 Amazingly astounding, Mount Kailash Mansarovar Tour takes you to two of the most frequently visited attractive sites in the country. Luckily, we have this trip and fortunately you wanted to visit such places as you arrive in Nepal. Mount Kailash is a beautiful mountain peak in the Kailas Range, which is the major part of the Trans Himalaya Range in Tibet. As it lies close to Mansarovar, we found it more efficient if we included a visit to the gorgeous lake as well. The mountain also has strong religious significance in context of Hinduism, Buddhism, Jainism and the Bön. Furthermore, we shall surely make a detailed visit to Lake Mansarovar. Extremely popular as an exquisite natural wonder, the major ingredient of the structure freezes in winter. This freshwater lake situates in the Tibet Autonomous Region in China, about 940 kilometres from China border. The lake situates at an altitude of 4,590m/15,060ft, a relatively higher elevation than a suitable attitude for existence of a similar lake. Any other expenses not mentioned in the cost include section. - 10 days by Helicopter via Nepalganj. - Kathmandu to Kerung (Nepal - Tibet border) tourist bus will be used. In Tibet, Toyota Landcruiser or Luxury Bus will be used. Routing Kathmandu - Kerung - Saga -Paryang -Mansarovar - Darchen - Dirapuk - Zuthulpuk - Darchen - Paryang - Saga -Kerung - Kathmandu. A. If you do not want to trek you can hire horse/pony for parikarma. Parikarma (kora) that is for 3 days. It will cost you approx. Yuan 1200 per Yak with Yak man. A. In Kathmandu you may use USD OR Indian Currency (however denominations of INR 500 & 1000 is not allowed in Nepal). For Tibet you will need Chinese Yuan only. for 11 days in Tibet we suggest you to carry approx Yuan 2500-3500 Per Person. Which you may need for emergency and to pay for horse during Kailash Parikrama. Balance (unused Yuan) may be exchanged again on the way back. A. Our team will provide oxygen cylinder in emergency. Usually, oxygen cylinder is not required. However, some yatri prefer to carry their own handy oxygen cylinders. You may buy small portable cylinder in Tibet. It may cost approx. Yuan 20-50 Per cylinder. A. Darchen (base camp of Mt. Kailash) is the last point where communication facility is available. Mobile will not work in Kailash region. It works only in town.